Item Size: 6-1/4" W x 1-3/8"
Shipping Weight: Poly Bag, 250 per carton @ 28 lbs. 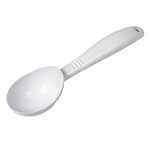 Customized Adjustable Measuring Spoon Item #HT-2131 is Promotional with your business logo for advertising to clients. 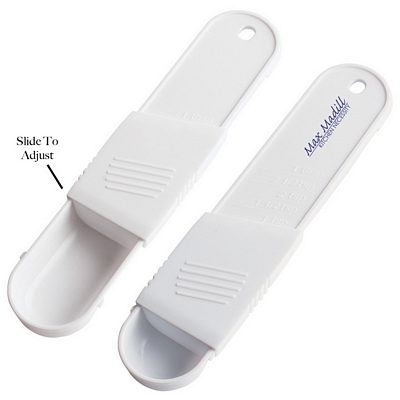 Customized Adjustable Measuring Spoon and other Promotional Measuring Scoops are decorated with No Setup Fees. 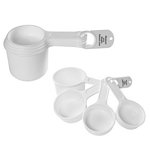 Customized Set of Four Measuring Cups Item #HT-2144 (Minimum Order: 100). Promotional Kitchenware like the Set of Four Measuring Cups can be personalized with your business logo and with No Setup Fees. Customized Ice Cream Scooper Item #HT-2145 (Minimum Order: 250). Promotional Kitchenware like the Ice Cream Scooper can be personalized with your business logo and with No Setup Fees.